Having decided that one of the main ideas behind the Master Hands project would be projection—projecting the found texts and movie clips so that others could view them, as well as projecting myself into those lives, traveling to the various places those texts might allow me to go—I had to begin deciding which pieces of the collection made the most sense to use and how, specifically, I wanted to use them. I began re-viewing the home movies I had purchased with a mind toward capturing and cataloging any and all instances of movement or travel—travel by car, certainly, but also boat, plane, whatever. My initial thought was to watch all the movies I had and then, after deciding which clips I wanted to use, go back and re-run those films, recording only what I actually planned on using. After more than a few close calls with misbehaving projectors, willful reels, and lengths of film that jammed and started to burn, Chris and I decided it was probably wisest just to record everything as it ran, deciding later what I wanted to use. We did most of the projecting and re-recording in the living room, using various projectors and a moldy old screen we had purchased at Good Will for three dollars. Chris ran the projector while I recorded what was being projected on the screen using my digital camera, my ipod and some Flip video recorders. I had a vague sense of wanting to do a video with four sections—a nod to the fact that Master Hands had been divided up into four sections or parts. I knew that I wanted one section to deal explicitly with travel, with being projected or transported from one place to another, and this would likely be the section of the piece that would feature the most of the original source video. To better determine what the other sections would deal with, I began editing and cataloging the re-recorded (i.e., now digitized) home movies according to the different themes or trends I noticed in that footage: travel/vacation sequences, parties or holiday celebrations, people avoiding the camera, people unwrapping presents, people waving hello (or goodbye), footage shot in cemeteries, and so on. At that point, all I knew is that one section of the piece would deal with the idea of projection/transportation (again, working with the idea of tracing the car’s movement or lifespan after it left the factory), that another would deal with resistance or avoidance, and that the final section of the video would feature the Walker Evan’s quote--“Stare, pry, listen, eavesdrop. Die knowing something. You are not here long”--followed by a montage of people waving hello—or depending on how you looked at it—goodbye. I wanted, in other words, for the piece to get to questions of projection, preservation as well as mortality, to get viewers to question who was watching who, whose life was on display, who, in point of fact, would not be here long, whose lives would not be viewed or remembered. Throughout the process of developing ideas for the piece and then while actually piecing it all together, I continually questioned whether or not I was doing this all correctly. It bothered me a great deal that I couldn’t see or learn what other people were doing, to understand how they were approaching the task. Despite this being labeled as an experiment, and despite being told that I was to use Master Hands plus anything else I wanted, I continually fixated on matters of proportion. Had I been able to see drafts of other people’s work and/or to discuss my plans with others, I could have made sure that I was using approximately as much of the source text as others were. Then again, that said, I had a pretty strong sense of what I wanted to accomplish and a fairly good sense of how I might use Master Hands to help me get there, so it’s quite likely that even if I had learned early on that others were composing pieces that were comprised, say, 75% of Master Hands footage, I wouldn’t have done much differently. On the other hand, had I known from the get-go that my piece would feature much less of Master Hands than other pieces did (provided that this was, in fact, the case), this would, I think, have resulted in less time and stress spent second-guessing my work, wondering if others were using more of the source material than I was, etc. Concerned that I still wasn't using enough of Master Hands in my work, I also created a sequence (one that never made it into any draft of the piece) where the family featured at the end of my piece was watching Master Hands, but there seemed little point to this, narratively speaking. It would have seemed to me a case of using Master Hands just because I needed to. I remain on the fence about the purposefulness (or lack thereof) of the still images from Master Hands contained in the Polaroid frames at the start of the section entitled “On reception, transformation and the complexities of projection.” When I set this shot up, I was mainly just curious about how it would look. And while I knew that I wanted to project something through one of the Polaroid frames, it made little sense to just assign random pictures to the other frames when I set up the test shot. Instead, I selected and used stills from Master Hands, hoping that viewers would make the connection between what I was receiving and subsequently working to transform, namely, the source footage from Master Hands. From the start, I approached the Master Hands project not in terms of what I could make or do with Master Hands, but in terms of what Master Hands could help me make or do--I'll have more to say about this in a later post, particularly as it relates to the use or proportion of source material to "other materials", as well as implicit understandings and/or definitions of what a mash-up is, should be, or do, etc. In an earlier post, however, I touched on some of the things I believed participating in this experiment could help me do: Learn a new computer and new software while providing me with something new and interesting to do during my first post-tenure summer, etc. In terms of content or focus, I was particularly interested in the lifespan, journey or process of the automobile once it had left the factory. An initial thought was to pick up on the final segment of Master Hands (where the car drives off the factory floor and down the road) and to ask: What happens next? Where does it go? Who or what does it come into contact with? What processes, activities, or assemblages did the automobile help facilitate, alter, transform, thwart? 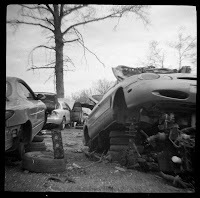 Another early thought was to fast-forward to the end of the auto’s lifespan and focus on junkyards, on various forms of destruction. This, in turn, brought to mind the potential of using Master Hands to compose a piece on photographers’ rights—an issue I felt was important, something I wanted to learn more about, something, in fact, I felt strongly that I very much needed to learn more about at the time. Some months prior to receiving the Master Hands invite, I had visited a junkyard on a photo shoot, and—long story short—I ended up having all my cameras confiscated before I left. 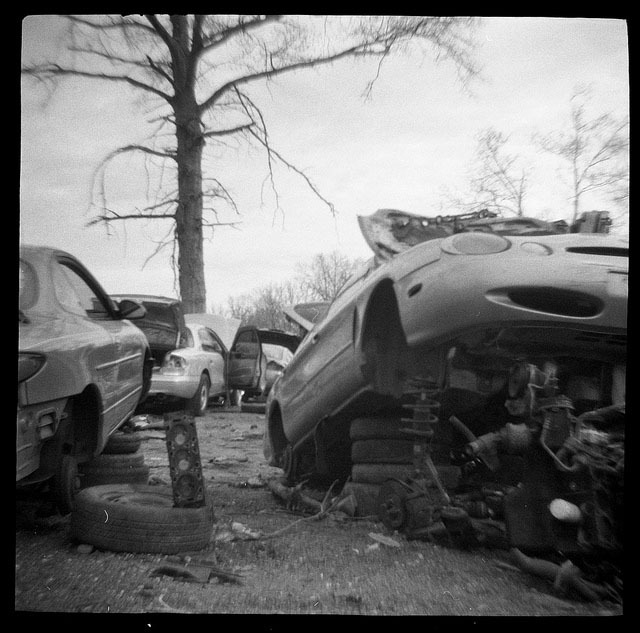 Hence the connection between new cars, junk yards, and photographer’s rights. I scrapped (no pun intended) the junkyard idea pretty early in the process, but remained interested in questions having to do with what happened once the auto left the factory. I still wanted, in other words, to pick up on that part of the story or process—to think about what the now-assembled automobile allowed users to go on to do, to see, to make, piece together, assemble, etc. In this way, the experience of collecting other people’s memories was always for me chiefly about transportation, travel and the various material processes involved with re-assembling these lives, and with this, of projecting myself into other spaces, times, and lives lived. Another perk associated with using these materials was that I didn’t have to worry about copyright infringement and wouldn’t have to limit myself to using materials from the Prelinger Archives. 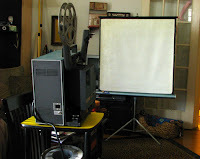 What’s more, I finally had the incentive, occasion or excuse to do something I’d been meaning to do for a while: To find ways of projecting, in hopes of better preserving and making available to others, some of the 8mm and 16mm home movies in the collection. I knew that I wanted to focus primarily on the still and moving images in the collection that featured cars and various modes of transportation/travel, but there was one home movie in particular, portions of which where shot from inside the car with the steering wheel in view, that I felt strongly would make for a wonderful transition between the end of Master Hands (i.e., when the driver places his hands on the wheel and drives the car off the factory floor) and some of the travel footage I had to offer. Having decided on the general point and direction of the piece, I began (with Chris’ assistance) the time consuming and often times frustrating process of projecting, viewing and attempting to successfully capture/translate/digitize the portions of those home movies I thought I’d like to feature in the piece.